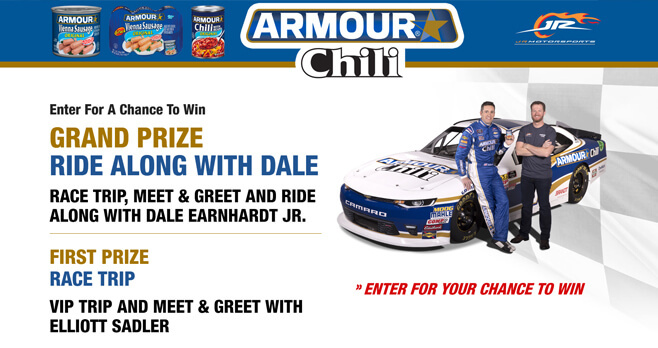 Visit www.armourpitstop.com and enter the Armour Ride Along With Dale Sweepstakes for your chance to win a race trip where you’ll have the once-in-a-lifetime opportunity to meet & greet and ride along with Dale Earnhardt Jr. The Armour Ride Along With Dale Sweepstakes is open to legal residents of the fifty (50) United States and the District of Columbia who are at least 18 years old at time of entry. The Sweepstakes begins at 12:00:00 AM ET on February 15, 2019 and ends at 11:59:59 PM ET on September 30, 2019. Limit one (1) Entry per person, household and valid e-mail address during the Sweepstakes Entry Period. The grand prize consists of one (1) 5-day/4-night trip for Grand Prize Winner and one (1) guest to Charlotte, NC departing on August 28, 2019 and returning on September 1, 2019 to attend a major motorsports race. Visit www.armourpitstop.com to enter and see Official Rules for details.